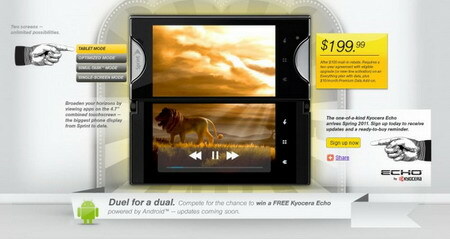 Sprint Kyocera Echo - the first dual-touchscreen smartphone with Android OS, gives you a full 4.7-inch screen! Home » android » kyocera » smartphone » sprint » touch-screen » Sprint Kyocera Echo - the first dual-touchscreen smartphone with Android OS, gives you a full 4.7-inch screen! Kyocera and Sprint have announced the first dual-touchscreen Android smartphone, Kyocera Echo, exclusively from Sprint. This Android-powered device features two high-resolution 3.5-inch WVGA touchscreen displays connected by a patent-pending “pivot hinge” that enables the two displays to operate independently, side-by-side or combined to form an oversized 4.7-inch (diagonally) integrated display. 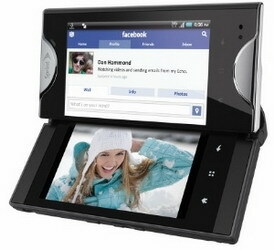 Title : Sprint Kyocera Echo - the first dual-touchscreen smartphone with Android OS, gives you a full 4.7-inch screen! 1 comments on "Sprint Kyocera Echo - the first dual-touchscreen smartphone with Android OS, gives you a full 4.7-inch screen!" I would like to receive a brochure with all information about the Echo, as well as a location in my area where I can purchase the cell phone - and the date the Echo will be available. I reside in the 19973 area. Thank you very much for your consideration.